Every season I like to look at all the cool clothes coming out for kids. So I've trawled the net, and here's some of the best stuff you can buy for the autumn winter season 2016 for toddlers / younger boys. Here we go, in no particular order these all caught my eye. 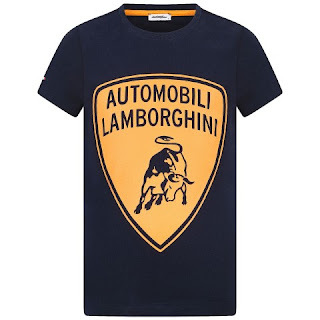 'Automobili Lamborghini' T shirt. £38 on Child's Play Clothing. I didn't know Lamborghini did clothes, but this is a fantastic print with the trademark bull. The orange on the navy blue makes it really jump out. Simple, but cool. This is one of those days I wish I was filthy, stinking rich. 'Tom and Jerry' printed sweatshirt. £9.99 by H&M. 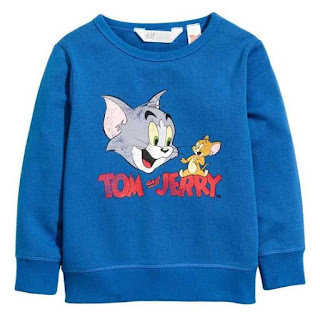 I haven't seen any Tom & Jerry stuff in a long time but this is iconic and love the way the blue of the sweatshirt frames their faces and the logo really nicely. If you have the cash to splash, I love the detailing of the different colours inside the bolts. Not that your kid will notice. 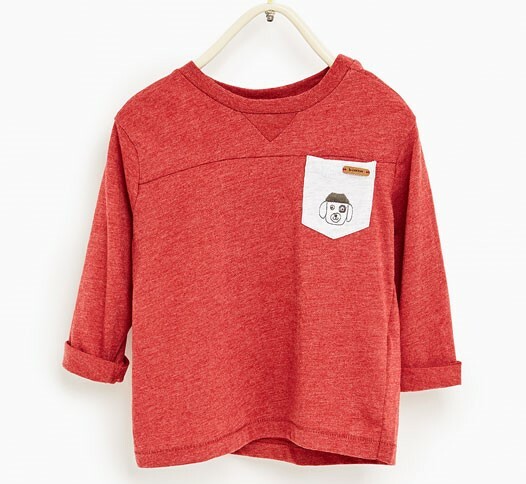 'Dog' embroidered pocket top, £3.99 by Zara Kids. This is a winner, and comes in several colours. Zara Kids is one of my favourite shops because it's so affordable, and this season doesn't disappoint. I want it all! 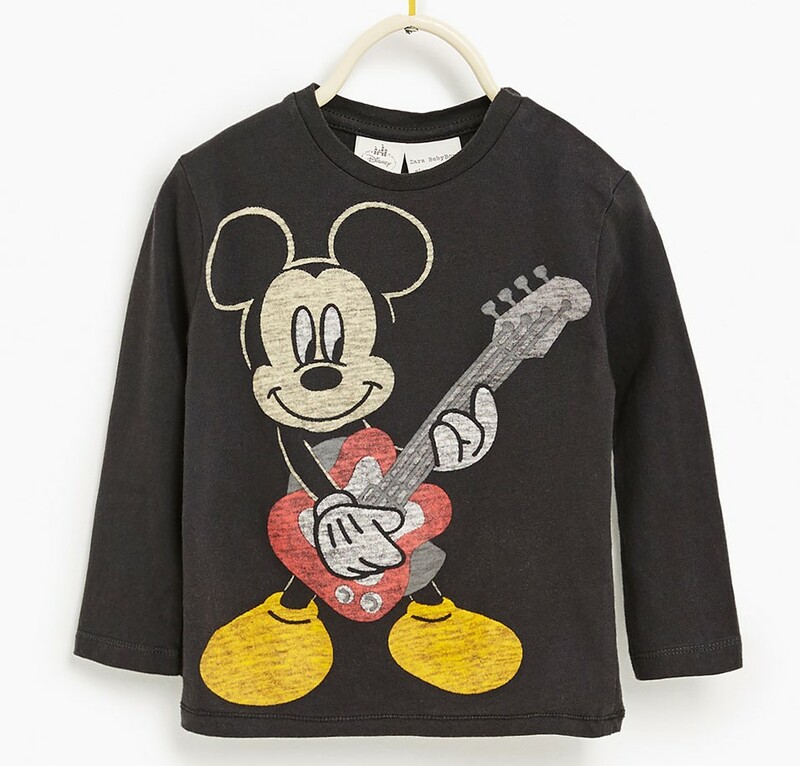 'Mickey Mouse' long sleeved top, £9.99 by Zara Kids. Love this one, and it even says 'Mickey Rock Star' on the back in a nice font. I wouldn't normally spend this much on a T shirt for a toddler, but it's tempting. 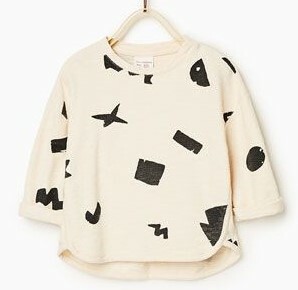 'Geometric' printed plush sweater. £9.99 by Zara Kids. Unusual and cool. I'm loving the different shapes and how it's like they are potato prints done by a kid. 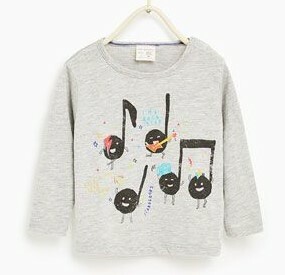 'Musical notes' long sleeved T shirt, £4.99 by Zara Kids. Each of the notes is like a band member. Cool. I've really got to get off the Zara website before I spend a fortune, but it's full of great stuff, I'm never disappointed. 'I need my own space' long sleeved top, £3.99 by Zara Kids. Really good price on this one, you know it's going to be good quality, and there's nice detailing with the 'catstronaut' and rocket patch. 'Tiger' cotton jumper. £6.99 by H&M. 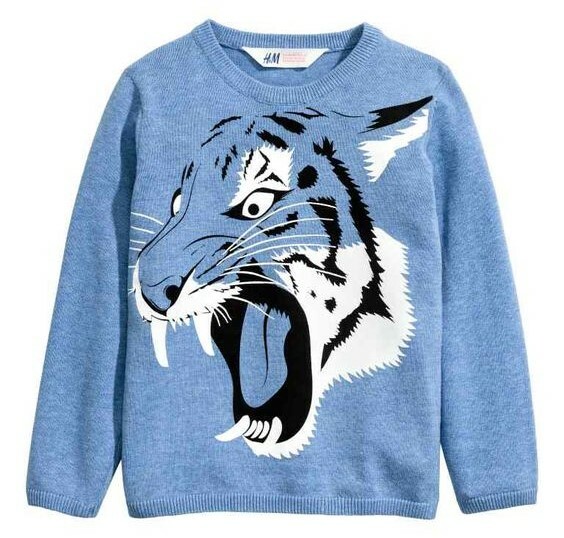 It's a bold print, just like the toddler who will be wearing it. You can't really argue when there's a cool jumper at this price. Love this one. 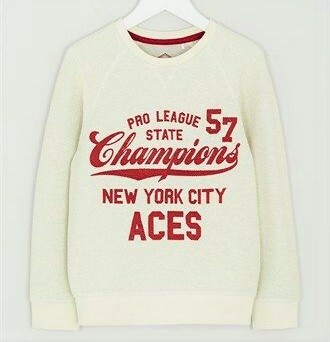 'Champions' sweatshirt. £6, by Matalan. You can't tell in the picture, but the material is really cool, kind of gauzy, it looks and feels a lot more expensive than it is. Retro and classy, this one. Proper Americana, the way it should be. 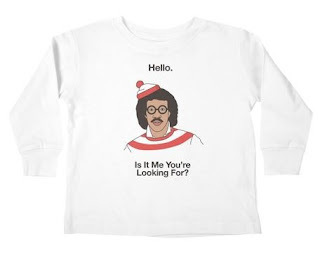 'Hello' T shirt, $19.99, by Threadless. When Lionel Richie and Where's Wally join forces, you know you're onto a winner. Threadless is based in America. I've ordered from them before and they have unique designs by artists and graphic designers from all over the world. These then get made into phone cases, clothes and all sorts. You can get this in hoodie format or an adult's T shirt. It's a great website, check it out. 'Karl face' top, £36 on Child's Play Clothing. 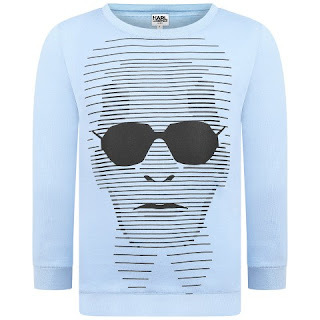 I'm not sure whether to laugh or cry about this Karl Lagerfeld one, but there's something mesmerising about it, and it's definitely a conversation starter! 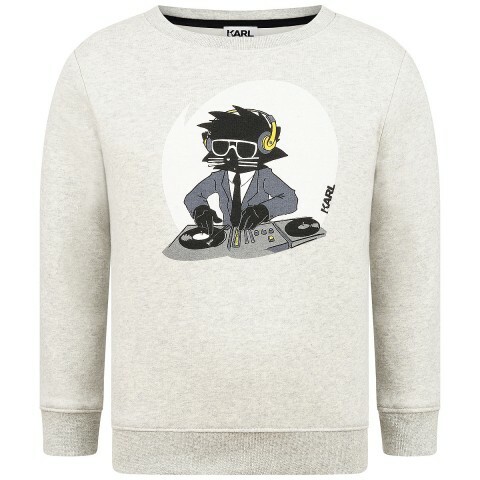 'DJ bad boy' sweater, Karl Lagerfeld, £51 on Child's Play Clothing. 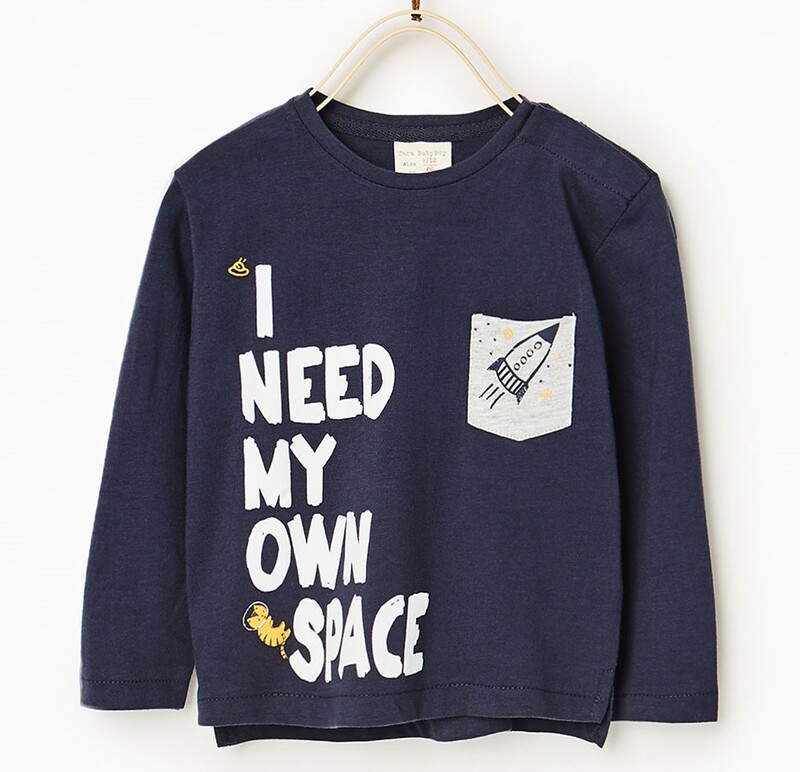 I could never justify spending this amount of money on a jumper that I know could be trashed by a toddler in seconds, but it's like it a lot. If your son's name is Karl, then even better, it would be a great present. 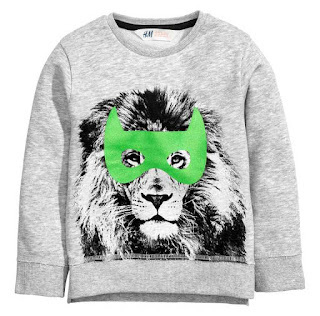 'Lion' sweatshirt. £9.99 by H&M. Love this one. I featured one of their lion T shirts in my last round up, and this one doesn't disappoint either. A very cool print. Hope you've enjoyed this fashion edit. Please share it if you did. These shorts make simple, cool, stylish body figure love to shop as availability of fashion online shop make it possible to discover the cool comfortable cloths. 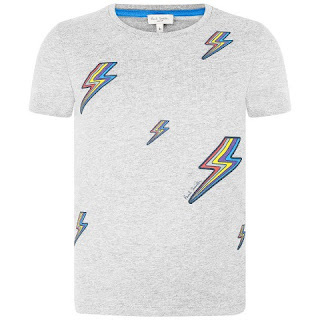 One thing that is very cool for young boys is graphic t-shirts. Young boys love shirts that sport their favorites in something. You have made a good suggestion. Printing t-shirt is expected by most of the members of young generation. Everybody likes to enjoy the printed t-shits for their specific and customized image and related captions.